I want to obtain all the techniques and gain a true understanding of everything in this world. The first one to mix blue and yellow called the new colour green. I want to do something similar to that. If blue is the chakra, then yellow is the seal, and green is the technique Just as there is no end to the variety of colours, there are so many thousands tens of thousands of techniques in the world as well. But in order to obtain every possible technique and truth, it would require an eternity. Only one who understands everything after spending such time on this can be fittingly called the Ultimate Being. When I watch this boy, I look back to the time I was called a genius, and think how ridiculous it was. Maybe, just maybe, there is no purpose in life. But if you linger a while longer in this world, you might discover something of value in it, like how you discovered that flower. Or, how I discovered you one fateful night. When there is a true desire in the heart and that desire is strong that is when he finds real strength that even he did not know he had. I refuse to let this happen! 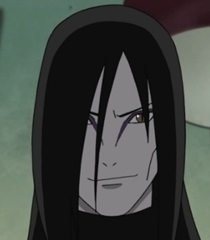 I am Orochimaru! I am immortal! I will not die here! Destined to discover the true meaning behind everything! Destined to take control of everything in this world! !